2,000 sea turtles hatchlings born in artificial nurseries were released Saturday, September 16th on the coast of Cambutal, in the province of Los Santos. 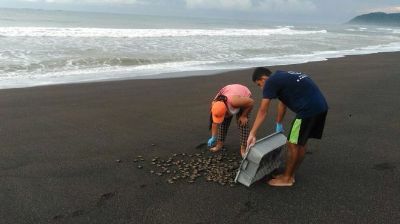 The hatchlings were the first to be released of the 32 thousand eggs in Cambutal nurseries. The announcement was made by Alexis Rodríguez, president of the ecological group Tortu-Agro, an organization that aims to conserve sea turtles populations in Panama. Rodriguez says, in Cambutal there are currently 400 artificial nurseries with 32 thousand eggs, of which 2000 have hatched and been released. During the remaining six months of the birth period, the rest is expected to hatch. The artificial nurseries are not only ensuring that more sea turtle hatchlings have the chance to make it to the sea, they offer insight into the nesting habits of several species of marine sea turtles. Between the months of August and December several species of marine turtles including the hawksbill turtle ( Eretmochelys imbricata ), the mulatto turtle ( Lepidochelys olivacea ) and the black tortoise ( Chelonia agassizii ) nest in the area.